I wanted to find some free software to easily create guitar tab snippets to post on this website alongside tutorials. A lot times I’ll come across a cool lick or riff mentioned in a video or lesson online that I want to write down for easy reference instead of having to fast-forward and rewind back to where the notes are shown or mentioned over and over again. Having music notation software that supports guitar tablature is good tool to have to help learn new guitar parts, patterns and shapes really fast. Sometimes when you learn a new riff it pushes an old one out of your brain. A quick look at the tablature can bring the notes combinations all back again. So without further ado, here’s the list of music notation software with tablature support for stringed instruments like guitars and bass. This list is in no particular order other than free options are listed first. MuseScore – MuseScore is free open source music notation software with a solid amount of features. MuseScore can import and export MIDI and MusicXML files and export to PDF, image formats, WAV and other audio formats. There’s also a MuseScore Player for iOS and Android devices. MuseScore works with Windows, Mac, Debian/Ubuntu, and Linux. LilyPond – LilyPond is free music writing software with special emphasis on creating beautiful sheet music following the best traditions of classical music engraving. LilyPond supports tablature notation and long list of features, and works with Windows, Mac and Linux. 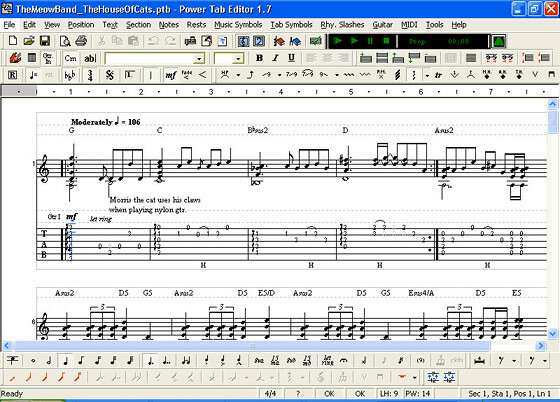 Power Tab Editor – Designed for Windows, Power Tab Editor is a free tablature creating tool designed specifically for making guitar sheet music. The software includes chord names, chord diagrams, rhythm slashes, bends, slides, hammer-ons/pull-offs, harmonics and palm muting. It can import MIDI tracks and can export to ASCII Text, HTML and MIDI files. It hasn’t been updated in forever but it still works well once you get used to it. TuxGuitar (Beta) – TuxGuitar is a guitar tablature editor written in Java-SWT. The software is free and supports GuitarPro, PowerTab and TablEdit files, and is listed as working with Windows, Mac, and Linux. Guitar Pro 6 – One of the most popular commercial options for guitar tablature editing is Guitar Pro, which has a ton of features and includes extra goodies like importing and exporting MIDI files and playing sound libraries like drums and guitars. It sells for around $40-$60 depending on the version. MusicEase Software – MusicEase has been developing music notation software for over 25 years, with special attention paid to creating a good user-friendly interface. The full version of their software can be downloaded and used for free; the only limitation is printouts are watermarked. To upgrade the standard version costs $80 and the Professional version is $250. The software works with both Windows and Mac computers. TablEdit – TablEdit is designed for creating, editing, printing and listening to tablature and sheet music for guitar and other instruments. TablEdit runs on Windows and Macintosh, and Lite versions are available for iPad and Windows Mobile. The demo version is limited; the full version of the software costs $60. Sibelius First – Avid’s Sibelius First is the big fish in the pond. Apparently it’s the world’s best-selling music notation software, according to their own claims. It costs around $120 and works with Windows and Mac computers. The online, plain text ASCII tab player works straight from your browser. The goal is to help you visualise the positions of the notes on the fretboard. I am looking for music software that takes regular music notation and transposes it to tab. I.e show me where that note is played on the fretboard, any suggestions? That’s a good question. MuseScore might be able to do that but I’m not sure about the importing. There’s gotta be something that works for that. did you ever find a solution , music notation to tabs..i am looking for it, too. Musesore! In case no one else answered Musescore 2 can do all of that, and very nicely! The original TablEdit, released in 1997, was written by Matthieu Leschemelle to aid himself to transpose in guitar tablature the initial aria from Bach’s Goldberg Variations. As more musicians started using TablEdit, Matthieu got feedback from those users, many of whom played other instruments besides guitar. Matthieu responded to their requests and input and as a result, TablEdit is not limited to guitar like other tablature programs. Through ongoing exchanges and feedback with experts on other instruments, Matthieu has developed support in TablEdit for harmonica, mountain and hammered dulcimer, chromatic and diatonic button accordion, drums, violin, tin whistle, recorder, xaphoon, ud, lute, autoharp, pedal steel guitar, piano, ukulele, and banjo. You can learn to read sheet music. I did. Using the right books, I taught myself. Now I tutor students at a local college. I’ve been tested by several of the college professors, and I have been approved as a tutor. Also, try to transcribing music live, or from recordings by ear. Tablature is the equivalent of painting by numbers. I can’t imagine Michelangelo doing that to paint the ‎Sistine Chapel ceiling. Don’t be lazy or ignorant. Put in the work, and BE SMARTER that everyone else!!! Very condescending. Tab is an efficient way of reading very quickly which position to play notes on the guitar. It has been used for fretted instruments for hundreds of years. It removes the need to make decisions about where to play a certain note as we all know the same note can be played in different places on the guitar. It is NOT painting by numbers it simply shows what note to play and where to play it, which is the aim of any music reading system. Notation also shows what note to play but not where to play it. One is a number one is a dot, big deal, try not to get snobby because it’s just numbers. Notation has the benefit of providing rhythm which Tab does not. Simply put, the best guitarists can use both systems and will not be afraid of either Tab or notation. Those players that want to read Tab without the headache of learning another system them go ahead it will help certainly and you should use your ears too. Those that want to read notation good for you it works. Those that can do both, perfect. Those that want to have silly little digs at people that can’t read notation please go away. While there are a lot of arguments pro and con for a guitar player learning the arduous language of standard notation, being insulted or shamed into it by an arrogant poseuer like you, is not one of them. Not only is your post arrogant and insulting, it is ignorant. If you knew anything about the history of guitar like instruments, you’d know that renaissance lute music, was written almost exclusively in TAB. Self righteous fools like you are a lot of the reason that so many promising players are turned off by the “traditional” path of music education. Shame on you…. Is there any music notation which let you show string bends as used in blues etc. I would like to be able to show full bends etc. No one seems to offer this. Power Tab Editor has the option to show eight different types of bends. I just discovered your cool site. As you do reviews of guitar notation software and other music tools and topics, I was wondering if you would want to review any of our music software. For example, our new guitar notation product MagicScore Guitar has a ton of features and is really affordable (usually sells for $29.95). 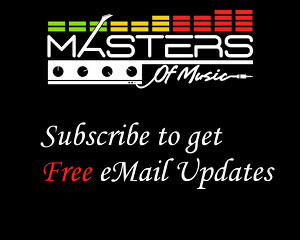 Let me know if you are interested, as I would love to give you a copy of that and any of our other music software titles that you might want to review. I don’t understand the pricing. It says $49 on your website, not $29, but it’s that price from some other websites. I don’t use this kind of software enough to properly evaluate and review it but maybe things will lead me that way in the future. Your software MagicScore is really interesting. I’d be interested in reviewing your latest version. Any app that will listen to chet atkuns jerry reed aongs and create tabs? There are plenty of apps and plugins that will tell you what notes are being played but I doubt there’s anything sophisticated enough to directly translate songs into tab. The youtube person has what seems to be software that you can drop a MIDI file into and it will show tempo in the notation section and tabs below. A vertical line with color sets the pace and the tabs change color. I want to take songs I have in mp4 format and just drag them onto this software to get this result. Is this humanly possible? How did this youtube teacher create these https://www.youtube.com/playlist?list=PLQI09WdCBjcQAjWnNAK4nFivHK_kOzBEX because it’s the only way I’ve been able to learn anything and I really wish I had this software but have no idea what it is. I emailed the youtuber but got no reply. I’ve heard that Guitar Pro can import and export MIDI files but I haven’t tried it so I don’t know how it works for that. Thank you. I hope it work for Bass (too). I use Stave’n’Tabs on my Mac and iPad now. It works nice with MIDI and Guitar pro files, and it is very easy to enter tabs. Besides it is free for iOS (though there are some IAPs, the basic features are quite enough for me). I recommend GuitarTabs (https://github.com/mathooo/GuitarTabs), its very basic and simple, but maybe that’s what you are looking for. It looks like Musesore is only available as an app for iPhone and iPad? Several reviews said that importing music is awkward. I use guitar pro 6. it is the best so far. Guitar Pro is not free and cost around 60$. I recommend free Gadwin Rockmer (https://www.gadwin.com/rockmer/). It comes with an impressive array of features. There’s also support for VST plugins for advanced sound processing and manipulation. You can start off from previous creations, with support for GuitarPro, Power Tab, TuxGuitar, TablEdit, and Rocksmith files. Do any of the Tab programs allow for altered tunings on guitar?